The 2018 Prix de West Invitational kicks off Next Week! Summertime always means a trip to Oklahoma for the annual The Prix de West exhibition at the National Cowboy & Western Heritage Museum. The museum is host to more than 300 paintings and sculpture by the finest contemporary Western artists in the nation. The premier art exhibition features work ranging from historical pieces that reflect the early days of the West, to more contemporary and impressionistic works of art. Landscapes, wildlife art, and illustrative scenes are always highlighted in the exhibition. Curt has been a regular at the Prix de West and has had many of his entries over the years win awards. His work Spring’s Caprice won the Purchase Award in 2007 and his entry from last year, Compilation of the Gods, a massive 70″ x 60,” earned him his 5th Buyer’s Choice. He has also clenched the Fredrick Remington Award 3 times. This year, Curt has three entries in this prestigious show. 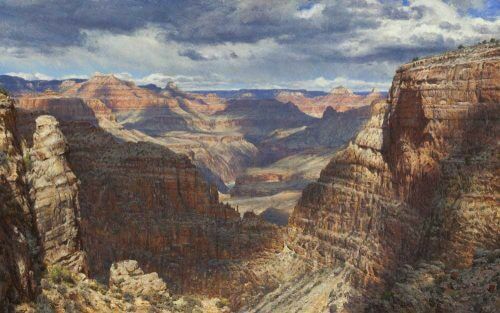 The largest of the three, Cathedral Gap, is one of the views Curt has always wanted to capture on canvas. This unique and epic scene is located 5 1/2 miles down the Hermit trail from the South Rim at the western end of the Grand Canyon. The Gap is a monumental V-shaped erosion in the towering Redwall limestone that frames a breathtaking view of colossal temples and expansive sky. Accented in the center of this grandeur is the Inner Gorge cradling the mighty Colorado River. Cathedral Gap is a 30″ x 48″ oil on canvas and is priced at $63,000. His trip to Washington state and British Columbia last year was no exception. It was a beautiful day at Friday Harbor in the San Juan Islands when Curt chose to add this view to his list of coastal paintings. You can see Curt painting this on his most recent video presentation created for his talk at the Tacoma Art Museum in April of this year. 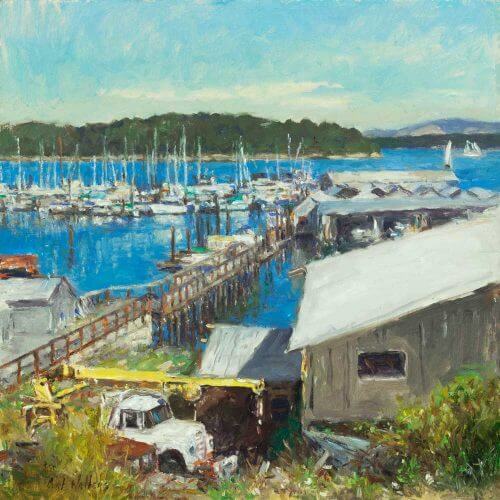 Jensen Boat Yard is a 14″ x 14″ oil on Canvas Board and is priced at $5600. 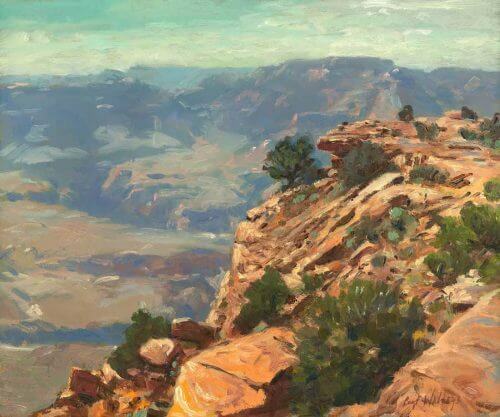 Curt’s first hike down the Kiabab Trail in the 1980’s left a haunting desire to paint the view of Cedar Ridge during the light of monsoon season. This small canvas panel view is the result of that desire. On a hot, and humid day, during what Curt calls his “crazy whim”, off for a hike he went. Even through the monsoon fizzled out and the clouds disappeared, the turquoise hues in the distance caused an amazing red reflected light in the shadows. Cedar Ridge is Curt’s third entry into this year’s Prix de West Show. It is a 10″ x 12″ oil on Canvas Panel painted in 2018, and is priced at $4800. Each year there are many events and chances to meet and mingle with the artists involved in the show. Opening day events kick off at 10am and ends with the Awards Dinner at 7:30. Saturday will be filled with seminars, book signing, awards ceremonies and concluding with the live auction and closing celebration. For a full list of event schedule, please visit the PDW site.